Oh AR, oh AR we hear… Well, whilst this project might be based in the rural county of Devon, but we’re not attempting to imitate farmers… Or Cornish pirates for that matter! Put simply, augmented reality (AR) uses computer-aided graphics to add an additional layer of information to aid understanding and/or interaction with the physical world around you. This is commonly exemplified through adding additional, rich digital information (or computer models), which are displayed through some sort of visual output screen. Although first developed conceptually in the early-1990s, recent advances in technology have only just enabled AR to begin to touch it’s potential, especially in a mobile context. With the first AR consumer applications developed around marketing purposes and run through static home computers, the range of applications has begun to spread into other areas, including education. Indeed, the past few years have brought a range of new application ideas run through feature rich mobile phones – often termed smartphones, such as the Apple iPhone and similar devices from other manufacturers utilising other operating systems (Andriod, Symbian S60, Bada). These recent innovations, as well as further conceptalised applications (both actual and imagined) have offered a glimpse into how we might make everyday use of this technology in the future (below) – with many powerful applications to suggest that this innovations may be the technological sleeping giant of the future. Making sense of a stroll around Central Park. Image courtesy of VentureBeat. On a technical level, the methods by which AR is achieved can generally be split into two broad categories: Marker-based, and markerless. AR application for marketing purposes. View of computer screen with AR car overlaid onto a physical 2-D marker. Further demonstration can be found on youtube: Toyota Augmented Reality Car and Mini Cooper Augmented Reality car. 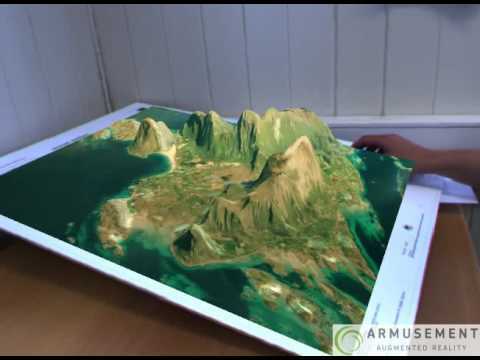 Educational applications of Marker-based AR could include 3-D modelling of geographic data (photo below). Numerous other examples include some fantastic e-learning AR resources for the national curriculum and a 3D sketch-to-model visualisation tool. By contrast, this technological approach has given rise to ‘mobile augmented reality’, denoting use of the technology with devices such as smartphones and tablets. This method uses a combination of an electronic devices’ accelerometer, compass and location data (such as the Global Positioning System – GPS) to determine the position in the physical world, which way it is pointing and on which axis the device is operating. Educational uses of this technology centre around approaches of discoverable learning: allowing learners to find their own pathways through content. Use of markerless technologies in education is an emerging area, yet some initial applications have appeared. CultureClic’s Augmented Culture for iPhone allows users to explore museums and cultural attractions in selected French cities without even stepping inside the buildings. With AR beginning to proliferate across a variety of applications in the consumer mass-market, educationalists have begun to look more closely at the potential these new technologies offer for learning. Hamilton & Olenewa (2010) describe how augmented reality can provide a rich contextual environment for learning, citing several possible uses of the technology including potential for skills training; discovery-based learning as well as modelling objects. Further analysis argues these technologies appeal to constructivist notions of education where students take control of their own learning, whilst also providing opportunities for more authentic learning appealing to multiple learning styles. Whilst this relatively infant technology is yet to achieve mass-market awareness amongst target audiences, the rapid pace of innovation offers inventive applications and user-interface improvements every day, all suggesting that this technology has real potential for informing high quality learning. Augmented Reality in Education: A University of Illinois Wiki with many further examples and additional resources. Further examples, as well as platform evaluations are detailed in our report ‘A Review of available Augmented Reality packages and evaluation of their potential use in an educational context‘. A new showreel for the Layar mobile AR platform provides an informative, if cheesy(! ), introduction to this technology as well as possible applications. 3 comments to What is Augmented Reality?